We just got back from another fantastic weekend with the Saskatoon Sunseekers. This time, we went to Manitou Lake Regional Park. It was more than a chapter outing; this was called a Mini-Samboree and included chapters from all over the province. I think there were well over 150 rigs there. Manitou is a very large campground. Our chapter was well represented and we did a lot of things as a chapter, but there were also mixers where we interacted with people from other chapters. Some of the old timers in our group seemed to know most of the others by name. 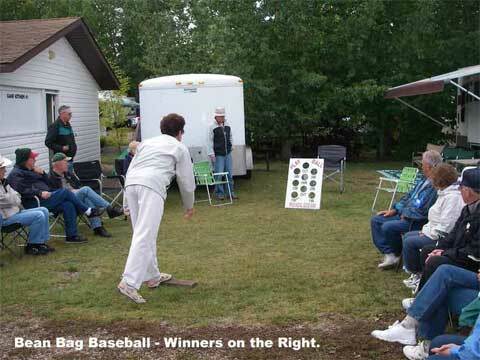 One of the activities that included people from all chapters was Bean Bag Baseball. It was a new game to me; I had never even seen it played before, but signed up anyway. With all modesty, I can say I acquitted myself well, scoring four home runs and numerous base hits. (I suppose I have to admit that I also struck out with bases loaded a couple of times.) I think our team won, but I never did hear the scores. Almost everyone left for home on Sunday morning, but we and three other couples stayed over another night. We went to one motorhome and watched the football game (wasn’t that great? ), went to Watrous for Chinese food, then back to another trailer for coffee and conversation. From here to Watrous, harvesting is well along. Pretty well all the Canola is in swath and other crops are in the swath, or in the bin. I wouldn’t say they are half done, but getting there. The weather for the past few days was pretty tough on combiners, alternating between sun and rain. It didn’t interfere with our weekend activities, but everyone wore rain jackets pretty well all the time. 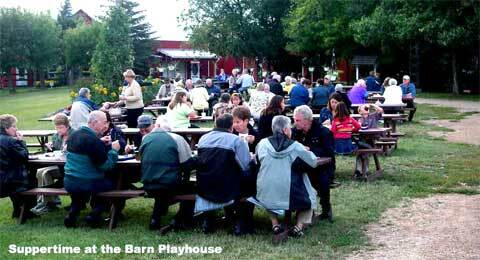 For years we have heard about The Barn Playhouse, north of Martensville, and finally we got our act together and booked tickets for last Thursday night. I thought it had a dining room, but what it had was several booths selling various food items and a bunch of picnic tables. We got a hamburger and piece of pie and enjoyed it. 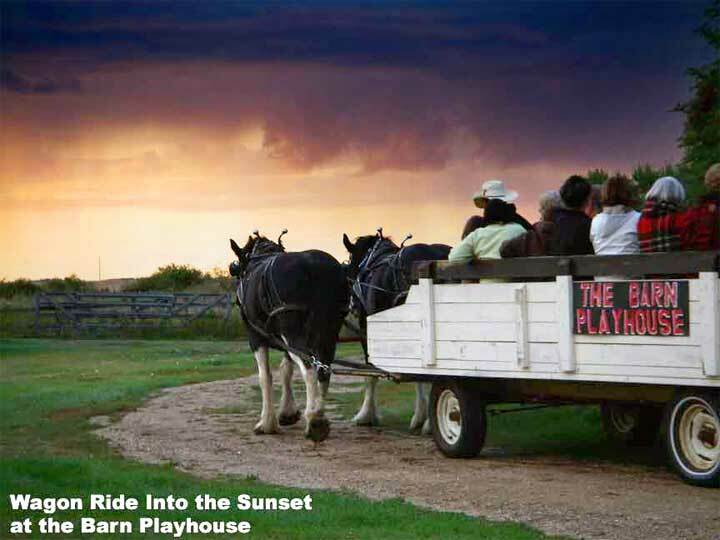 There also a craft shop, antiques on display, and horse and wagon rides to keep people occupied until showtime. The show itself, “The Boxcar Kids” was a cute story about four kids who have been orphaned by a boating accident. The officials don’t know what to do with them, but talk about having to split them up because the youngest one is “slow”. The kids take exception and skip out at the first opportunity, living by their wits and wiles in the bush and finally finding an abandoned boxcar to hole up in. Each found in him-, or herself, particular talents that contributed to their welfare including the youngest who turned out to be a very capable inventor. The main actors were local kids from grade three to grade nine and they were terrific. Now we know what to expect, we plan to go more often. I went to see Merv Miller last Tuesday, but he had been released from hospital that morning. I just phoned Shirley and she says they stayed at son Brian’s place after leaving the hospital, and came home on Friday. Visitors by the dozen ever since! Shirley says Merv is doing well. Ronnie Hirtle had his surgery last Tuesday but we didn’t get up to see him before leaving for Watrous. Will have to phone and see if he is still in hospital tomorrow. Our baby-sitting stint went well – I think. Aaron and Nicole went shopping while Doreen and Lucille baby-sat and I slept. When I got up, they handed Logan to me and announced that they were going shopping too. 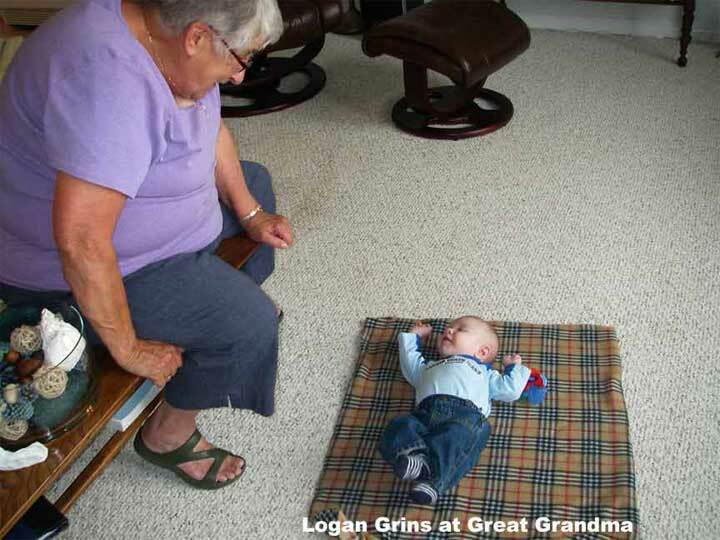 They didn’t even get out the door before Logan started to holler, but they didn’t stop. I didn’t have anything for the tyke to eat but as he had already eaten everything Nicole left I suspected he wasn’t really hungry. I walked and walked with him on my shoulder. Finally, the yells quieted down and were replaced by hiccups, then silence. He slept like a baby until the girls got home, about an hour later. I hear via the grapevine that Nicole was mad at me for not phoning her when he started yelling. She doesn’t let him cry at all. That ain’t the way we raised ours!